The 2018 AWEX-TAFE finalists; front, from left, Sophie Watson, third, Matilda Scott, first, and Josie Post, second. Back row, Lena Price, Harry Kemp, Jack Finch and Tom Hurley. Photo -AWEX. 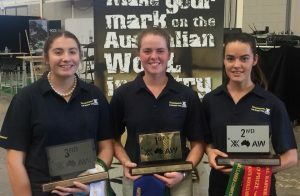 AUSTRALIA’S recently-crowned top wool classer graduate Matilda Scott is keeping her agricultural career options open. 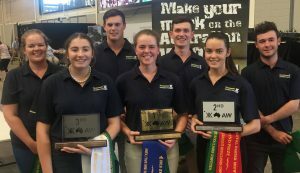 The young Tasmanian Merino breeder last week won the 2018 AWEX/TAFE National Graduate Wool Classer Competition with a consistent performance across all wool types. Matilda, 19, won the prestigious competition and Golden Stencil at the Sydney Royal Easter Show on Wednesday from six other mainland graduates. Her trainer at Tasmania TasTAFE Evelyn Archer won the Dennis Teasdale Perpetual Trophy. Second place in the competition went to Josie Post from Wuddina in South Australia with her trainer Colin Loffler of Tafe SA and third place was taken by Sophie Watson of Kentucky in New South Wales with her trainer Pauline Smith from TAFE NSW at Armidale. The other finalists were Jack Finch from Picnic Point, NSW, with trainer Stuart Murphy, Hunter Institute of TAFE; Tom Hurley of Boorowa, NSW, with trainer Fiona Raleigh, Riverina TAFE, NSW; Harry Kemp from Binnaway, NSW, with trainer Frank Roberts from TAFE Western at Dubbo, and; Lena Price of Pyramul, NSW, with trainer Kerri Capill from TAFE Western at Bathurst. 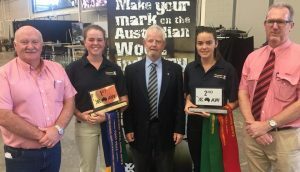 The 2018 AWEX-TAFE National Graduate Wool Classer Competition placegetters, from left, Sophie Watson, third, Matilda Scott, first and Josie Post, second. Photo – AWEX. Matilda said she is yet to use her stencil, but intends to put it to use in semester breaks and holidays from the Bachelor in Agricultural Science course she started at the University of Tasmania in Hobart this year. Her parents run a fine-superfine Merino ewe flock for wool and prime lamb production near Cleveland in Tasmania’s Midlands region and she has had experience with Polwarths and Corriedales. Her parents currently join their Merino ewes to Southdown rams, but Matilida said is lobbying for the ewes to be mated to Merinos and proudly backs the ‘Breed More Merino Ewes’ campaign by the Australian Association of Stud Merino Breeders. She recently started her own fine-superfine Merino stud with 49 16-17 micron Yalgoo blood ewes and a Nerstane blood ram from the Trefusis stud. “I’ve loved wool for such a long time,” Matilda said after winning the competition. Matilda considers crutching “a great skill to have”, but also loved science, would love to be involved in research and has done some work experience with crop trial researchers. The 2018 AWEX-TAFE National Graduate Wool Classer Competition judges, from left, Bob Mead, AWEX, John Mills, NSW TAFE, and Simon Hogan, Elders, with winner Matilda Scott and runner-up Josie Post. Photo – AWEX. The judges of the competition were AWEX wool technical officer Bob Mead, TAFE NSW industry liaison manager John Mills and Elders National Wool Selling Centre manager Simon Hogan. Mr Mills said the overall standard of the finalists’ work was very good and they all did a great job representing themselves and their training organisations. “It is reflection of the fact that the students only become finalists when their training organisations think they are capable of performing at that level. He said Matilda gave a good consistent performance across the three simulated classing exercises involving crossbred, medium-strong Merino and fine-superfine Merino wool. The competition finalists also had to put an AWEX ID on 10 samples against the clock, value wool on a clean and greasy basis according to an AWEX ID and do an oral presentation justifying their superfine-fine Merino classing decisions. “In Matilda’s case, she was able to aggregate things across all four activities and come out the winner,” Mr Mills said. Mr Mills and AWEX wool classer registrar Fiona Raleigh said the finalists’ performances and the closeness of the top three placings reflected the consistency of the national wool classing training standards, qualification and learning resources. “The closeness of the top three placegetters from the different states demonstrated that the national standards were consistent and working,” Ms Raleigh said. AWEX said the 2018 competition was in its seventh year and is regarded as a litmus test of the quality of wool classers completing their training. Competition supporters included AWEX, NSW TAFE and the Royal Agricultural Society of NSW.